Sunscreen. It becomes our second skin in the summer months. Aside from it being the most important product you will put on your skin to protect it from aging, it is the single most critical step in preventing skin cancer. This is not news to most of us. What you may not be aware of is the astounding amount of chemicals found in most sunscreens today. It is alarming and, quite frankly, irresponsible for many popular brands (yes, even those brands which tout an “all natural” ingredient list) to put these so-called chemicals into the very product we’re applying on our entire bodies. *The EWG recommends that we avoid sunscreens which have oxybenzone yet many of our sunscreens contain this chemical. The EWG also states that “several common chemical filters appear to be endocrine disruptors”. Great. Just what we need. It’s MADDENING! The solution? 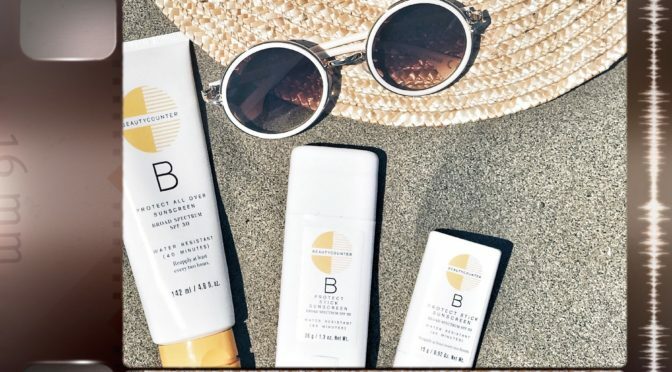 (Cue the chorus of angels) A NON-TOXIC, non-irritating, physical blocking sunscreen from Beauty Counter. It contains non-nano zinc oxide and titanium oxide, which sit on the surface of the skin and physically bounce or reflect sun’s rays away from the skin, hence the term “physical blocker” (ie: it does not get absorbed into the skin). It is broad spectrum, which blocks both UVA and UVB rays. It is the ONLY mineral sunscreen we’ve tried that actually rubs into our skin and leaves no white residue. After wasting a lot of money on other mineral sunscreens which made my entire family look as though we had just smeared Desitin all over our bodies (talk about annoyed young boys), I nearly gave up. Then, my friend recommended Beauty Counter. I have to admit I was skeptical based on my experience with so many other “natural mineral sunscreens” but I decided to give it a try anyway. And I’m glad I did. I have never purchased another sunscreen since (aside from a tinted sunscreen from Skinceuticals, which I will highlight in a future post). These three Beauty Counter products will be mainstays in our beach/pool bag, my car, and even my husband’s golf bag … I have them stocked everywhere! See links below for easy ordering. I have all 3 of the products on hand at all times but if you’re looking for a place to start, I would order the tube and face stick. Below is a list of additional Beauty Counter products that I can not live without (unrelated to sunscreen). It’s important to note that Beauty Counter is a non-toxic company, who is committed to a health and safety standard that goes well beyond what is legally required in the US. Their “Never List” is made up of more than 1,500 questionable or harmful chemicals that they will NEVER use in their products. **I am not a physician and I am not offering medical advice. It is important to check with your doctor before using a recommended product. **Please follow instructions on sunscreen label. Sunscreen should be reapplied every 2 hours and after swimming for extended periods of time and/or toweling off. Always follow the detailed instructions first and try to stay out of the sun between the hours of 10:00 am-2:00 pm.